Is there a way my forms can be delivered in a pdf form style? Hope this tip helps and addresses your concern. Please let us know if you need further assistance. ok... but lets say the person fill the form online and clicked the send button... is it posible to recieve it on a pdf form style? on my email? Unfortunately, this feature is currently not available with JotForm. The best thing you can do to obtain a pdf file of your submissions is to follow Allan's procedures. 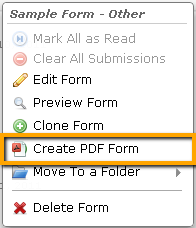 Log in to your JotForm account, navigate to your form's submissions, and convert them into a pdf file. Hope this helps. If you do have further issues and concerns, please feel free to contact us again.